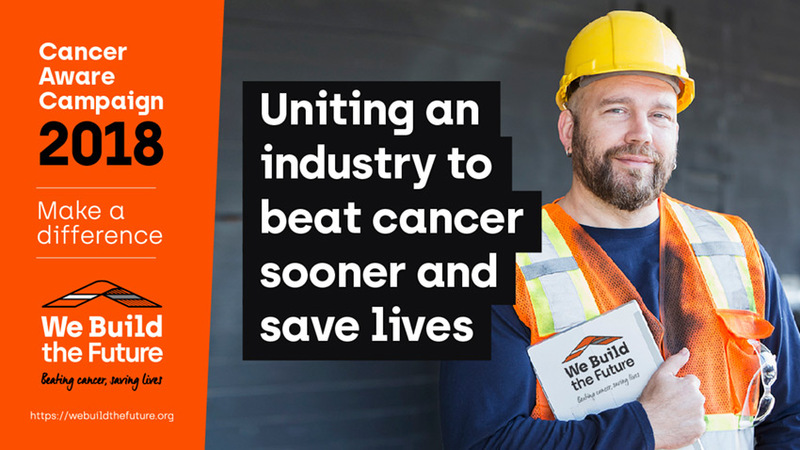 Launched in July 2018, charity We Build The Future has announced a new campaign – Cancer Aware 2018 – to start to raise cancer awareness in the Construction and Built Environment Sector. One in two people will develop cancer at some stage in their lives – and cancer is now the biggest killer amongst men, and the biggest killer of working age women. We want more people in our industry to get the advice and support they need to help beat cancer and to make people aware of how they can help to reduce the risk of cancer in the first place. Too often cancer is seen as a taboo subject – but to save lives and help people beat cancer we need to raise cancer awareness across the industry. We want people to become cancer champions in their organisations by signing up to our e-mail alerts and promoting our campaigns so that people know where to go to get the advice and support they need. We are at the start of building an industry wide movement to normalise conversation about cancer and building support networks to help people deal with cancer in their lives whether that’s is a personal diagnosis or cancer amongst family, friends and colleagues. If you have any worries, concerns or questions about cancer, get the advice and support you need by visiting our support page or by phoning the experts at Cancer Research on the cancer helpline: 0808 800 4040. Learn more about why being cancer aware matters with our key facts and tips including how to reduce the risk of cancer and stay fit, how to promote health and wellbeing in the workforce, and why supporting future cancer research is so important. Help build a network across the industry. Follow the Cancer Aware 2018 campaign on twitter at @webuildtf or #beatingcancersavinglives and Re-Tweet to raise awareness. Subscribe to We Build The Future e-mail alerts to get future updates and news. Donate an hour of your earnings every year to help develop new campaigns. Complete a short short cancer survey developed by We Build The Future so that we can start to understand how best to help people.